4-Word Review: They are watching us. Aliens, who dress in suits, long overcoats, and bowler hats, invade earth and an attempt to police everybody’s thoughts and actions while trying to quell a rebel uprising led by Colonel Stutz (Larry Storch). Working for the uprising is Harry (Guy Stockwell) who falls in love with Barbara (Susan Oliver) who secretly sides with the aliens. The movie starts out with a lot of potential and piqued my interest with unusual montages and camera work. Unfortunately this subsides quickly and soon we are stuck with drab sets, extraneous scenes, and a film unable to hide its low budget roots. I began to wonder if the reason the rebels had their hideout in an abandoned farmhouse was more because the filmmakers could film there without having to pay for a permit than anything else. The film should have gone completely for parody and farce and if they had done that this might have worked. Instead it seems to drift into a conventional sci-fi narrative complete with a pseudo philosophical climactic debate between the humans and aliens that we have all heard before and does nothing but slow the film down to a tedious level. Adding in the love interest angle between the two leads is contrived and formulaic. The aliens aren’t too interesting either. There is never any explanation as to how they were able to take over the planet, but the fact that they are unable to even get through a locked door of an old crumbling warehouse made me wonder how they were able to succeed at anything. Equipping them with a little more sci-fi gadgetry would have helped. I realize they don’t have to be carrying around the proverbial ray-gun, but having them break up an angry mob by using ordinary canisters of pepper spray seemed unimaginative. 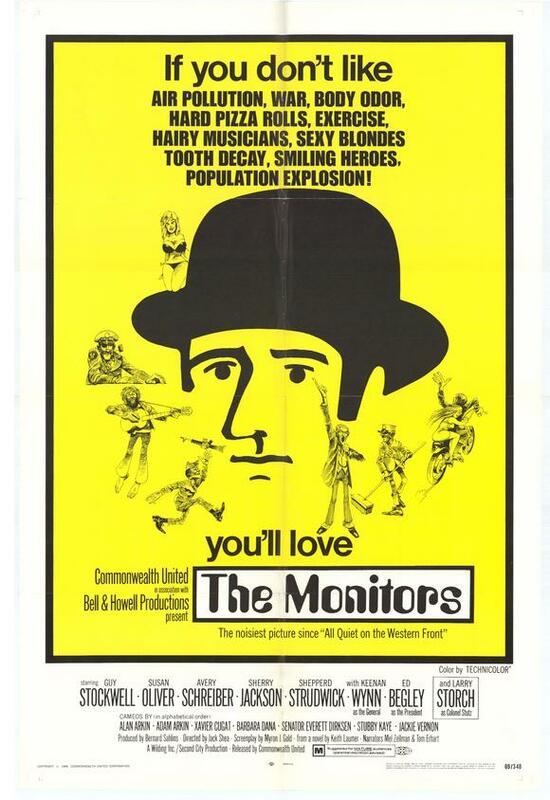 Spliced into the story are comical TV ads with famous celebrities of the day such as Stubby Kaye and Xavier Cugat promoting the monitors and convincing the public to support them. These commercials are not funny with the only exception being Alan Arkin playing a foreign man who speaks broken English. In the case of former Senator Everett Dirksen it is almost sad. He was very elderly at the time of the filming and he is clearly reading his lines from cue cards and mouthing the words and looking like he is barely functional, or coherent. The music is another problem. Initially I really liked it as the opening credits feature a computer with a very robotic voice singing the theme. Singer Odetta sings most of the other songs and some of them have a distinctive sound, but they get overplayed and saturated by the end. The production was shot on-location in Chicago and I loved the aerial shots showing the skyline. I almost wished there had been a little more of them although I did notice that the exact same skyline shots at the beginning get reused in the second half. I didn’t like the idea that it was filmed in the late fall/early winter as the cast is shown shivering in several shots while forced to wear light clothing and their breath is clearly visible. Susan Oliver gives another solid performance and shown flying an airplane in one sequence as in real-life she was an avid pilot. Sherry Jackson’s presence is minimal, but she is always appealing to the eyes. Avery Schreiber, a comedian known to overact horribly in just every part he is in, comes off as rather amusing here playing the younger brother of Harry who reluctantly joins up with the resistance. Larry Storch, another notorious ham, is engaging as well especially when he appears in drag and later on dressed as General MacArthur. This is a failed experiment that should have been a lot better. It seems to want to take on the quirky sentiments of the era, but is either too timid, or too unimaginative to go all the way with it. This entry was posted in 60's Movies, Comedy, Low Budget, Movies that take place in Chicago, Obscure Movies, Quirky, Sci-Fi and tagged 60's Movies, Entertainment, Movies, Review. Bookmark the permalink.